Bela Lugosi won’t seem so terrifying if you’ll just remember he’s a stamp collector. 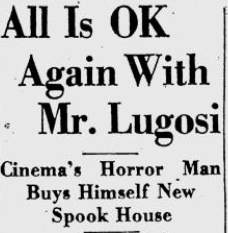 HOLLYWOOD, Sept. 1 – Everything’s all right again with Bela Lugosi, our favorite spook; he’s just bought a special spook house, so he’ll feel comfortable after spooking hours. This home of Lugosi’s features dark crannies, beamed ceilings, split doors, green glass windows, iron balustrades, high walls, trick buzzer systems, and similar details to delight the heart of a professional Dracula. It cost him a pretty penny, too. And that’s all the more surprising because Lugosi was on relief four years ago, drawing $15 a week from a Government which decided that though jobless, ghosts had to eat. How the human monster, the firnd who chopped his cinema enemies into small pieces gradually so they’d suffer the most, happened to be broke and without a spooking chore anyplace makes one of those Hollywood stories. How he got back into the bogey-man groove again is more surprising still. “I came to the United States from Hungary in 1923,” he said, “and almost before I could learn to speak English, I was playing in romantic comedies on Broadway. I was the big, tall, leading man, with the great big smile. I made love to the ladies and solved the predicaments in the stage and I was doing fine, I felt, when I was offered the part of ‘Dracula.’ It ran for a year at the Fulton Theater and when finally it closed Bela Lugosi was a monster in human form. Only work I could get was monstering. So he was a zombie in the movies, Frankenstein’s boy friend, the black cat, the bloody phantom, the hungry ape, the Oriental murder man, and the vampire with the steel claws. He starred in dozens of horror pictures. “I was doing fine again, ” Lugosi continued. “I bought myself a $30,000 home in the Hollywood hills. I had not one automobile, but two, and money in the bank, and then four years ago an utterly horrible thing happened. “The British censors decided there would be exhibited in England no more horror pictures. The Hollywood producers decided that if they couldn’t gat British profits, they’d simply stop making horror films. So they stopped. When things were at their blackest for Lugosi, so were they for the Regina Theater, a neighbourhood house on Wilshire boulevard. It was an independent theater and it couldn’t get good pictures. Audiences wouldn’t pay to see the kind of films it did get. The Regina was about to close its front door when the manager drcided on a desperate expedient. He installed a triple horror bill, consisting of films featuring Spooks Lugosi, Karloff, and others. To the amazement of all Hollywood, customers, intent on being scared to death, mobbed the place. Other theater owners in other towns repeated the stunt with the same results. The spook market boomed. Universal and other studios rushed new horror films into production and there was Spook Lugosi again, trying to decide which film offer to take. He started horrifying folks all over the place and he’s been giving ’em goose pimples ever since. When he finished “Spooks Run Wild” for Monogram the other day, he was ready to pay cash for his spook castle, erected some 30 years ago by an eccentric and since deceased German count. Lugosi’s spending several thousand dollars to modernizing it (leaving in the spooky atmosphere, of course) and all looks well again for one of the pleasantest human monsters we know. Dad’s Horror Role Pleases Lugosi Jr.
HOLLYWOOD – Bela Lugosi’s horror performances on the screen have been so convincing that more than one woman who sees him on the street faints, but he is not scaring his four-year-old son, Bela Jr. The youngster for months, eversince the meaning of his father’s profession penetrated, has been after Lugosi to let him see one of his pictures, but the actor decided the shock might be harmful to him. However, little Bela finally had his way and the family went to a revival of “Dracula” after Lugosi again and again warned the lad in order to cushion the horror of the film. Bela Jr. thought his daddy was funny, and ever since has been rushing about the house impersonating Dracula instead of Superman.